As the copy-editor of the online edition of this book, originally written and published by John Anthony Marin, I must distinguish my contri­bution from that of the author. This introduction is, of course, my own and a few other parts mentioned below are my additions as well. But this is Marin's book; my main contri­bution, besides copy-​editing, has been to save it from obscurity and bring it to the larger audience that it deserves. The title of John Marin's book, My Army Days: A Soldier's Memoirs , describes its contents well. It fits into a now large class of auto­bio­graphical accounts of the second world war by Canadians who parti­ci­pated in it. I have read more than a dozen of these with authors ranking from private to general. This corporal's short book scores as one of the best but is also the rarest. Not everyone who reads the 130 pages of Marin's book will end up with a favourable opinion of the author. That seems strange; most memoir writers take pains to ensure that this never happens. They do this by carefully filtering the information reported and sometimes by nudging the facts a bit. Marin avoids this and readers benefit from his unvarnished account of the vocation and avocation of being a soldier in wartime. Even those who have concerns about the author's conduct must admire his honesty and openness. According to the two library catalogs, WorldCat and Amicus, the paper edition of this book is held by only three libraries in the world. These include Library and Archives Canada, the Canadian War Museum, and the United States Army Military History Institute. The book has been out of print for some time but occasionally used copies will appear on the lists of online booksellers. If you want a copy of the original edition you are probably out of luck. The paper edition of this book was published in 1999 by its author, John Anthony Marin. As a self-​published book, it did not benefit from two services normally provided by commercial publishers, copy-​editing and promotion. My contri­bution includes aggressive copy-​editing and limited promotion. My role as copy-editor encompassed the usual tasks of attending to grammar, punctuation, and spelling as well as some checking of facts. The spelling of proper nouns was a challenge. Marin did well with the many difficult European place names that he and I could check but less well with the spelling of names of members of his regiment, many of which I could not check. I have corrected a few including the consistent misspelling of his platoon commander's surname, “Dunkelman”, spelled here correctly. An early decision that I had to make was how to handle the numerous and often obscure acronyms and abbrevi­ations used by the author. Most authors take care of this by providing a glossary at the beginning or end of the text, but Marin neglected to do so. With space not being at a premium in an electronic version, I decided to simply spell out these in the text, with a few exceptions. The exceptions include a number explained by Marin in context and several that are better known as acronyms. The latter include the insecticide, “DDT”, and the German military organization, the “SS”. Finally the term “Jap” in the original has not been expanded to “Japanese” because of the differing connotations of the two terms. Both are used in the book. This version reprinted in the same format as the original might be several pages longer because of this spelling-​out decision. I have gone beyond the simple editing of the copy to make several additions to the book. The original paper publication had six unnamed parts with no chapters, titles, subtitles, or table of contents. Here the parts have been converted into chapters with titles and one level of subtitles. From these has been generated the table of contents for this edition. The annotated bibliography did not appear in the paper edition and contains related books, particularly ones that I used in the copy-​editing process. As the copy-​editor of this electronic edition, I have tried not to compromise the author's simple and forceful style. Marin has an important story to tell and he tells it well. I sincerely hope that I have been faithful to the author and have produced an edition that would meet with his approval. The author of this book, John Anthony Marin ( 1923 -​ 2005 ), was born in Kilmar, Quebec but, as a child, moved to Cardinal, Ontario with his family. He received his schooling in Cardinal and, while a teenager, joined the local army militia. 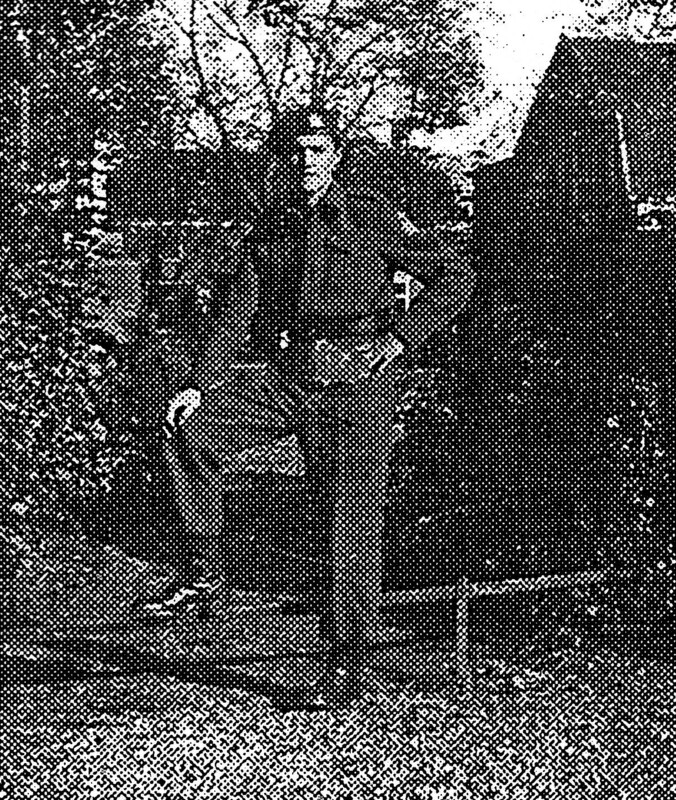 From there he volunteered for the active army and served in Canada and Europe. It is this latter period in his life that is the subject of his book. After being discharged from the army in 1946, he briefly attended Queen's University and then went to work for the Dominion Tire Company in Kitchener, Ontario. He was married in 1950 and continued to work in Kitchener for the following three years. John Marin and his wife then moved back to Cardinal where he found work with the Canada Starch Company. He remained in Cardinal for the rest of his working life and during his retirement. His life in Cardinal was characterized by a number of public service activities including acting as a cub­master and scout­master and culminating in the writing and publication of this book in 1999, after his retirement. John Marin wrote and published the paper edition of this book as a service to others. He could not have made a profit from it and probably never expected to. His life of service to his country and to people in many countries combines with the low marginal cost of electronic distribution to dictate the appropriate price for this edition of his book, zero. To download this book, you need not identify yourself and you will be neither required nor permitted to pay. You are permitted to redistribute this edition of the book but must leave it intact, in its present form, and distribute it without charge. The paper edition of this book did not have an international standard book number (ISBN) but one was assigned to it after publication. It appears as “ISBN 0-9686875-0-4”, stamped on the back cover of the copy held by the Canadian War Museum. This copy gives the Library of Congress call number as “D 811 M365 CWM 1999”. The Amicus library catalog gives the Dewey decimal number as “940.54/​8171 21”. I encourage readers to contact me with mistakes that I have missed, mistakes that I have made, or other comments. I can be found at “web_adm at Bezeau dot Ca”, after making the changes required to get an email address from this. After enjoying twelve years of retire­ment and just loafing around, I decided to take the plunge and learn how to use the computer. Tiring of playing solitaire and chess, I learned to type using the two-​finger style. What to type? 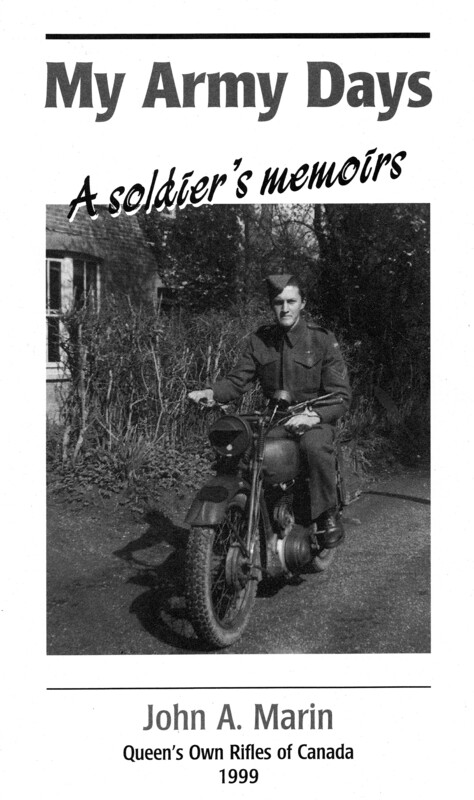 The idea came to me that some of my nieces and nephews might like to discover what I did during the war years. This then is the story of those exciting and scary days. I also wanted to mention some of the friends that I made along the road. They made it easy for me to get along in a few dangerous situations. This book is also a part of their war years. Many thanks to Jack Martin for supplying some battle dates and to Patti McCurdy for the lessons on using the computer.